‘The footprint of books is everywhere in history, and their visual depiction is – quietly but insistently – everywhere in art’. The stock saying that a picture paints a thousand words is well-worn. However, Jamie Camplin and Maria Ranauro are breathing new life into this notion with their recent publication, Books Do Furnish a Painting. In a vast project, containing a veritable gallery of one hundred and sixty-five illustrations which take the reader on a comprehensive tour of the past five hundred years of painting, Camplin and Ranauro explore the dynamic relationship that exists between the written word and visual art. Specifically, the two authors consider the depiction of books in famous paintings. What, at its most fundamental level, is the book? What is its function in our daily lives and in the wider world? And why is it an important artistic object, or indeed an object for the artist’s eye? These are the questions that frame Camplin and Ranauro’s discussion of the painted book. The book as an object is considered from varying yet converging perspectives: as a religious symbol, as a domestic and homely object, as a figure for cosmopolitanism and world-wisdom, and finally as an emblem of refined knowledge, learning and cultural sophistication. Medieval and Renaissance painters like Fra Angelico, Hugo van der Goes, Raphael, Sandro Botticelli and Albrecht Dürer, later artists such as Johannes Vermeer and Rembrandt, and even twentieth-century artists like Marc Chagall, André Derain and Stanley Spencer have all depicted scripture and religious texts in their pictures to show the sacred wisdom and devotional learning of their painted subjects. Reading, before anything else, was a holy act, initially reserved for the literate few – scholars and intellectuals, priests, monks and members of the nobility. To depict a religious text in a painting was therefore to present a visual emblem of the word of God. The domestic reader – a role that many of us fulfil today when we open a paperback in the comfort of an armchair or wrapped up in a duvet – came into being with the development of the Gutenberg printing press whereby books could be mass-produced and commercially distributed for widespread public readership. In paintings by Jean-Etienne Liotard, Pietro Rotari and Robert Braithwaite Martineau we see young women displayed in the private, contemplative act of enjoying a good book. Not all artists treated the subject of women and books with this kind of tenderness however: after J. D. T. de Bienville’s suggestion in 1771 that reading could lead to mania and hysteria in women, depictions by Bernard d’Agesci and Antoine Wiertz show the female reader in the throes of a frenzy. Such paintings belie a patriarchal paranoia about the corrupting influence of literature on impressionable young women but, thankfully, later artists come to celebrate the presence of the book in domestic life. Sir John Lavery, Vanessa Bell, Pierre Bonnard, Henri Matisse and Pablo Picasso all portray the ‘woman with book’ as the very image of the intelligent, educated, modern female sensibility. Reading can take place anywhere: in the home, on the train (that’s you, commuters), aboard a plane, on a park bench, by the sea. Joe Wright of Derby, Arthur Devis, Pompeo Batoni and Luca Carlevarijs all paint aristocratic young men and families who have brought the book as a tool and symbol of education out into the world on their travels. 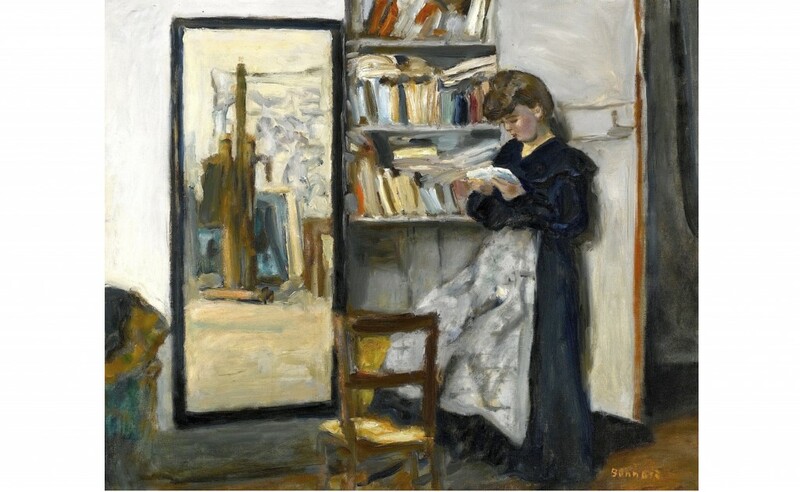 Later, in paintings by Gustave Courbet, Edouard Manet, Augustus John, Winslow Homer and Sir John Lavery, we see books being read by sprawled figures in country scenes, and in works by Edvard Munch, Guy Pène du Bois and Edward Hopper, the book is seen as a transitional, versatile object, enjoyed in public spaces like the bar, the city square, the diner and even the brothel. Ultimately, the book is an enduring symbol of knowledge: the presence of academic and educational texts in works by Arcimboldo, Jan Davidsz de Heem, Ludivico Carracci, Caspar Kenckel, Vermeer and Jonathan Richardson represents the breadth of human learning, of man’s desire to know about the world. Subjects painted by Manet, Paul Gaugin, Edgar Degas, Egon Schiele, Pierre-Auguste Renoir, Paul Cézanne and, later, Alice Neel, sustain this tradition – education and intelligence encapsulated within the little painted pages of the handheld books. So, books are everywhere in paintings – but what about paintings in books…? 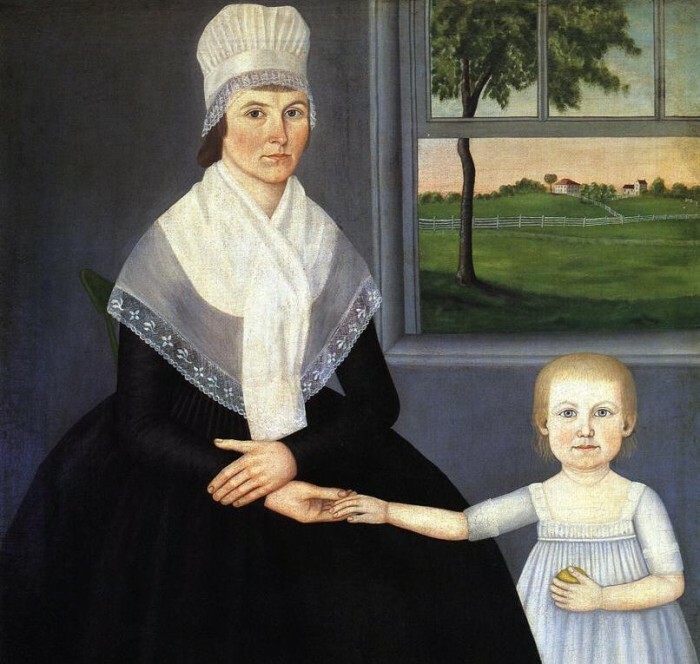 ‘Each child stood in a doll-like pose, and was brought to life by an incisive gaze. The effect was unsettling. The key, as I found out, was that John Brewster was profoundly deaf, and the same was true of many of the children he portrayed’. ‘Have you seen that picture by Anselm Kiefer? It’s of a forest. 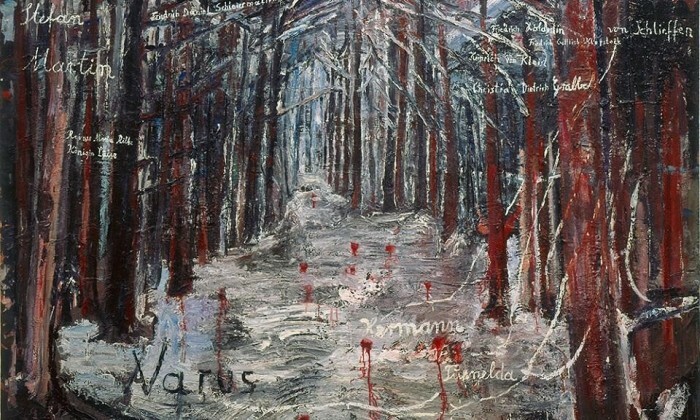 All you can see is trees and snow, with red stains in places, and then there are some names of German poets written in white. Hölderlin, Rilke, Fichte, Kleist. It’s the greatest work of art since the war, perhaps in the whole of the previous century. What does it depict? A forest. What’s it about? Well, Auschwitz of course. Where’s the connection? It’s not about ideas, it reaches right down into the depths of culture, and it can’t be expressed in ideas’. 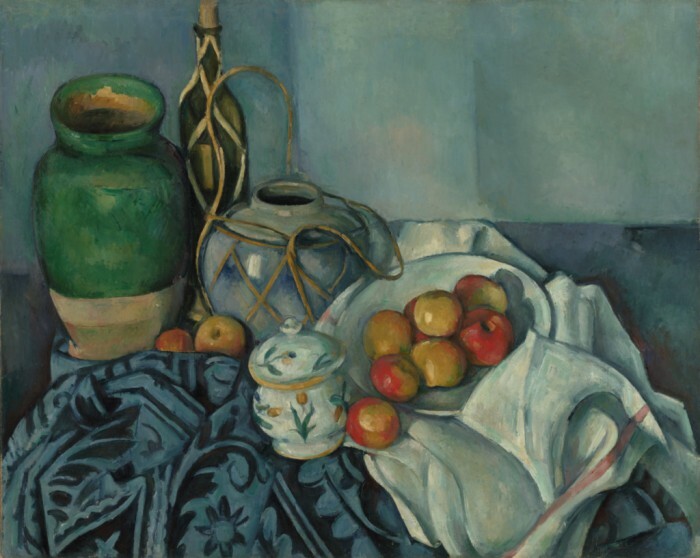 ‘The name Cézanne was to him a magic word. He had first learned about Cézanne from Pissarro the painter. Pissarro indeed was the man from whom all the early Cézanne lovers heard about Cézanne. Cézanne at that time was living gloomy and embittered at Aix-en-Provence’. 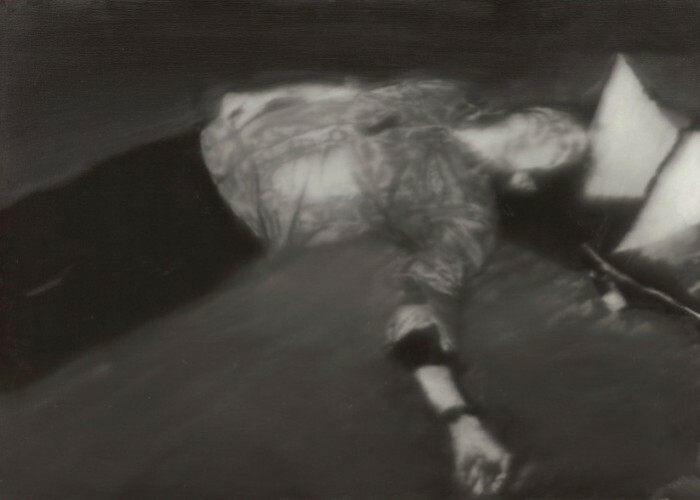 ‘The two paintings of Baader dead in his cell were the same size but addressed the subject somewhat differently, and this is what she did now – she concentrated on the differences, arm, shirt, unknown object at the edge of the frame, the disparity or uncertainty’. One thing is clear: literature and art are inextricably bound up with one another. The relationship is not always a happy one, but it is a reciprocal one; books borrow from paintings; paintings borrow from books; each encroaches on the other’s space; each contains endless references to the other’s narratives. Camplin and Ranauro’s study is essential reading for anyone wishing to understand the long, interwoven histories of paintings and books.